We are leading manufacturer and supplier of wide range of Heatless Air Dryer. We are leading manufacturer and supplier of Internal Heated Air Dryer. We are believe in quality base product with customer satisfactory and we have satisfactory customers through out INDIA.We have in house manufacturing unit and follow the manufacturing & design coding system. 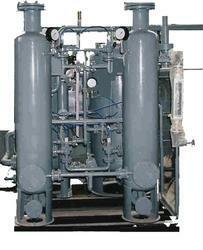 We offered REACTIVATED BLOWER AIR DRYER as per clients requirement with customize capacitiy. In this dryer the regeneration air is supplied from a blower which is heated in a heating chamber and thus increasing its moisture carrying capacity.This hot air is passed through the desiccant bed for regenration. 1) Low operating cost for high capacities. 2) Dew point up to (-)60 Deg C can be achieved. 3) Most economical in the rang from 1000 CFM onwards. 1) Heat Eneregy required for regeneration. 2) High capital cost makes it economical for high flow only. Child water Air Dryer (Double effect type). H.O.C. (Heat of Compression) Type Air Dryer. Heat less Type Air dryer. Internal Heated Type Air dryer. Blower Reactivated Type Air dryer. Split Flow no purge loss Air dryer. We offered INTERNALLY HEATED DESICCANT DRYER supply minus 40 degree F pressure dew point air for critical requirements for pneumatic instruments,controls and sensitive process air. 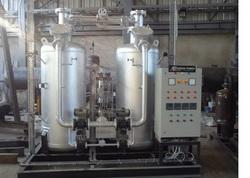 Hydrogen Gas Dryer for generating Cooling Application etc. When there is less compressed air to spare.Van Air heated regenerative compressed air dryers provide the solution by requiring less purge air for desiccant regenration.Compared to a heatless dryer, ATMOS POWER PVT LTD internally heated dryer delivers significant savings through purge air reduction.